House Sparrows and European Starlings were both introduced to North America in the 19th century. hey are now permanent residents found across the United States and Canada, almost always near areas of human habitation and disturbance (e.g., cities and suburbs) or areas with a reliable food source, such as barns or granaries. house sparrows are one of the most widespread animals on this planet. ​House sparrows thrive on the food and shelter we provide. They prefer to live anywhere there are people. it is illegal to harm or harass any native species, including their nests and eggs. but readily use nest boxes when available. They outcompete native cavity-nesting birds, and are known to destroy nests and eggs, and kill nestlings and adults while taking over an occupied nest site. ​They fiercely defend their nests, so they are vilified for edging out more popular native species, especially bluebirds. probably the number one enemy of bluebirds and purple martins. but they attack and kill adult bluebirds sometimes trapping and decapitating them in the nestbox and building their own nest on top of their victim's corpse. House Sparrows are also prolific breeders, able to raise up to four broods per season, with each brood averaging between four and five eggs. The most successful method for preventing exotic species from breeding in your nest boxes is simply to move your boxes placing your nest boxes in natural areas away from densely-populated locations will prevent many non-target birds from ever finding them. (about 300 feet). 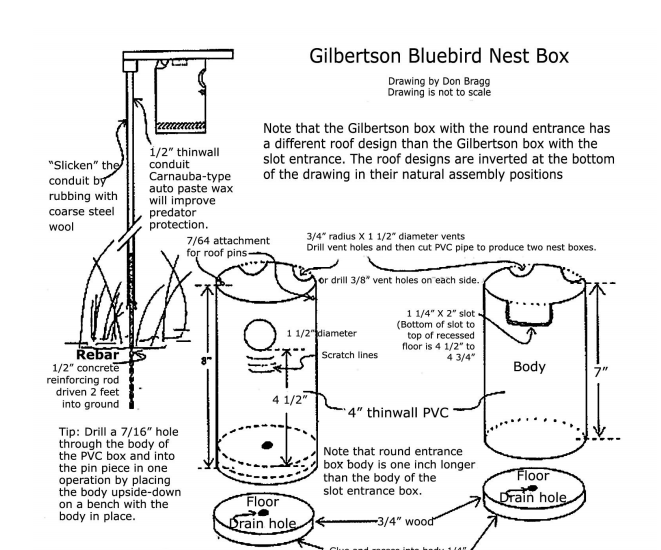 Gilbertson PVC boxes are often avoided by House Sparrows. House sparrows stay put all year while native songbirds migrate. So, sparrows can get a jump on claiming nest boxes early in the season. Some nest box providers wait until migrants arrive to install boxes. Or they keep the entrance holes plugged until migrants get to the area. Put up two next boxes between 5 and 15 feet apart. Some nest box providers believe that if house sparrows claim one box, these territorial birds will keep other sparrows from using the other leaving it free for another species. House sparrow visit open-air restaurants to help themselves to leftovers and dropped crumbs. Prompt clean up is the best way to discourage visits.